(V5) (purified): conjugated to KLH. Provided as 400µl of slurry (200µl gel + 200µl buffer). 100µg of the affinity purified antibody is attached to the gel at a ratio of 500µg antibody/ml of gel or 250µg IgG/ml of 50% slurry. Affinity purified antibodies were coupled to agarose beads using a cyanogen bromide method. Our Abpromise guarantee covers the use of ab1229 in the following tested applications. IP Use at an assay dependent concentration. Use at a concentration of 15 - 20 µl of gel slurry per 0.1 to 1 mg of protein lysate or extract. Publishing research using ab1229? Please let us know so that we can cite the reference in this datasheet. Est-ce que je peux remplacer votre cell lysis buffer par un tampon RIPA pour l'IP ? J’ai contacté le laboratoire et un tampon de RIPA pourrait peut-être fonctionner mais nous ne pouvons pas le confirmer car nous ne l’avons pas testé. J’aimerais cependant mentionner qu’en utilisant un détergent assez fort comme du SDS il y a plus de risque de déstabilisation du complexe anticorps-antigène, ce qui pourrait diminuer l’intensité du signale. Si ceci est le cas, je vous recommande de suivre notre protocole standard pour l’IP. Our labs have tested this product using 0.1 % triton X-100. 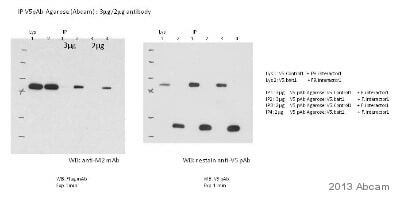 Hi, I ordered the Anti-V5 tag antibody to concentrate my V5-tagged protein. Do you have a protocol that for how long should the agarose beads be incubated with my solution of interest and in which conditions? Do you recommend certain kind of centrifuging afterwards, for example 30 min 13000 rpm? Is it possible to dissociate the protein of interest from the beads afterwards? 1. The agarose beads with the antibody bound to them are ready for use when you receive them. 2. Place the beads in a column and equilibrate with the appropriate buffer, usually two to three column volumes of PBS or TBS (1M NaCl). 3. Pass the media or serum that contains the protein of interest through the column. 4. Collect the “flow through” of unbound protein. 8. Regenerate the column by passing several volumes of elution buffer over column/beads (e.g. with three column volumes of glycine-HCI, pH 2.5***) Immediately re-equilibrate with equilibrating buffer (PBS or TBS) until the effluent is a neutral pH.or dialyze against a desired buffer. 9. Store the agarose-antibody beads in a buffer containing a preservative i.e. 0.1% sodium azide at 2-8 deg C.. They may be used many times. * Occasionally, low pH may cause the eluted protein to aggregate. In such cases choose an alternative buffer for elution, for example 3 M sodium thiocyanate. The column may lose activity after prolonged exposure to low pH. ** Elution by Peptide: This is a milder elution method. Elute the bound tagged fusion protein by adding 5 X 1 column volume aliquots of a solution containing 100 mg/ml peptide in PBS. Note: peptide has a detectable absorbency at280 nm and also interferes in other protein determination assays that are based on peptide bonds. Therefore, it is recommended to determine the eluted amount by Coomassie staining of SDSPAGE relative to a known standard. ***Do not leave the column in glycine-HCl for longer than 20 minutes. I hope it is helpful for you. If not, please do not hesitate to contact us to assist you further. Thank you for your enquiry. The buffer that we know it works in has a concentration of 0.1% SDS and 0.5% deoxycholate. I hope this information will be helpful. If there is anything else that I can help you with, please do not hesitate to contact me. I am trying to purify protein using this product. Can the protein be competed off the beads with V5 peptide instead of boiled off? Thank you for your enquiry. Theoretically this will work, but to the best of our knowledge it has not been proven to work satisfactorally. I hope this information helps. Please do not hesitate to contact us if you need anything further. I would like information about your agarose-immobilized anti-V5 antibody. The intended application is immunoprecipitation followed by western blot. My V5-fusion protein is ~55kb, so I am concerned about interference with the IgG heavy chain. Will the antibody remain bound to the agarose after I boil my samples in reducing SDS loading buffer (containing DTT)? Thank you for your enquiry. Following immunoprecipitation, some heavy and light IgG chains may be eluted with reducing buffers such as Laemmli. This may cause interference with your V5-tagged protein. The best and cleanest approach would be to IP using a V5 antibody raised in one species (e.g. mouse) and perform a western blot using an antibody raised in another (e.g. rabbit). I hope this information helps, please do not hesitate to contact us if you need any more advice or information. I am interested in using your agarose-conjugated anti-V5 antibody for immunoprecipitation, but I am concerned about the stability of the cyanogen bromide linkage. I have read, for example, that CnBr linkages may be incompatible with Tris-based buffers. Have you found this to be the case with your crosslinked antibodies? Also, will the linkage be disrupted by boiling in Laemmli buffer? Thank you for your enquiry. Tris based buffers will not have an appreciable influence on the agarose immobilized antibody. Some heavy and light IgG chains will be eluted with reducing buffers such as Laemmli. I messed up the story I apologize, I wanted to order the same amount that I ordered last time (if possible for the same price). We acknowledge receipt and would like to thank you for your request of bulk quote for the ab1229. I am currently working on our best quotation and will be contacting you in the next couple of days.